You can use work items to track and manage your work and information about your team project. A work item is a database record that Team Foundation uses to track the assignment and progress of work. You can use different types of work items to track different types of work, such as customer requirements, product bugs, and development tasks. 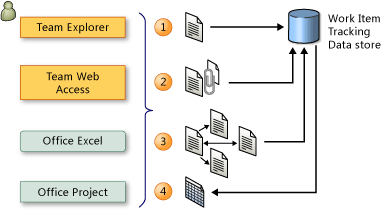 The work item type determines the workflow states and transitions. The work item types that are available in a project depend on the project template that the project uses. Also, you can customize the work item types that are available in your team project to track your work in the way it makes sense for your development environment. Each work item represents an object that is stored in the Team Foundation database. Each work item is assigned a unique identifier, a work item ID, and type, the work item type. Work item IDs are unique across all work item types in all team projects in a project collection. The work item type determines the work item fields that are available for tracking information, defaults defined for each field, and rules and constraints positioned on these fields and other objects that specify the work item workflow. Every change made to a work item field is stored in the work item log, which maintains an historical record of changes. Fields that contain information about the work item. Rules for each field, such as the set of possible values. A work item form that controls how the work item fields are displayed. A simple state-transition model that work item type authors can use to define required fields and values at different points during the work item’s life cycle. A set of common system fields. Comprehensive record of changes to the work item. Support for links to other work items, file attachments, or any other work product in Team Foundation. You can create and modify work items by using Team Explorer, Team Web Access, Office Excel, or Office Project. When creating or modifying individual work items, you can work in the work item form, by using Team Explorer or Team Web Access. You can make bulk updates to many work items at a time by using Team Web Access, Office Excel, or Office Project.